Umbrellas make drinks taste better. It’s October and you may be relishing the first chill in the air, the L.A. StormWatch of the season and pumpkin flavor popping up on menus everywhere but The Spare Room at Hollywood Roosevelt will be celebrating sultry tropical islands and their delicious tropical cocktails tonight at its special Night of Tiki event, brought to you by Kraken Rum. This night also happens to be SR’s Director of Beverages Aidan Demarest’s last night before he kicks off things at his new Glendale bar, Neat and Naomi Schimek takes over. By the way, Naomi has lots of exciting things planned for the Spare Room. Someone say, “cocktail lessons”? But tonight’s Tiki event will also bring in Aidan’s Liquid Assets cocktail consultant partner Marcos Tello and John Lermayer of The Florida Room in Miami’s South Beach. Check out what the guys are serving up tonight, including the recipes for you to try out at home if you want to hold on to summer a little bit longer. 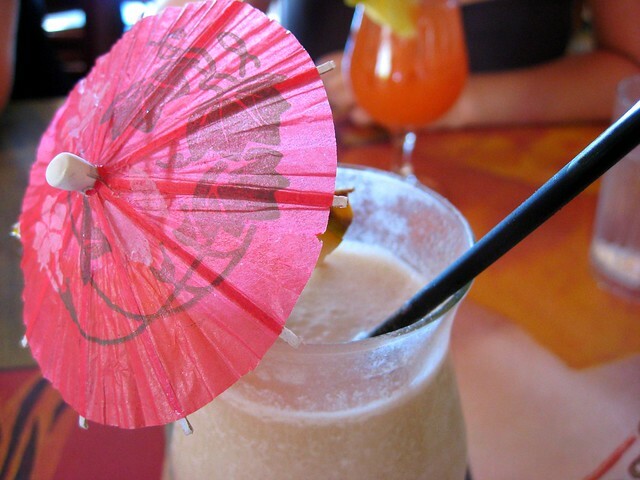 Don your best Tiki garb and hula to island music at this sultry Tiki event. Hit the jump for the cocktails that the fabulous Marcos will be serving up tonight. Demerara Sugar and stir thoroughly until it has dissolved. thoroughly until it has dissolved.